Certificates Temporary certificates are issued at the end of class; cards are issued 1-2 business days after course completion. Food Coffee, pastries, and juice are provided for full day courses and weekend training. The instructor did a fantastic job. He went through the code books and explained it in detail. I learned a lot. I would recommend... The instructor did a fantastic job. He went through the code books and explained it in detail. I learned a lot. I would recommend this class again. The instructor was great. I enjoyed very much. The instructor was great. I enjoyed very much. One of the best instructors that I've ever had. It was a pleasure to go to class. One of the best instructors that I've ever had. It was a pleasure to go to class. It was a great experience. It was a great experience. Awesome instructor - would definitely recommend ppl and take more courses! He makes it real easy to understand what you need... Awesome instructor - would definitely recommend ppl and take more courses! He makes it real easy to understand what you need to know! The class was well organized and informative. The class was well organized and informative. He took the time to go over the answers and made sure everyone understood what he was saying. I would say he was very fair... He took the time to go over the answers and made sure everyone understood what he was saying. I would say he was very fair with everyone. If l had to take another class, I would want him as my instructor! 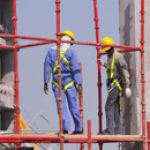 Swing Staging Training & Safety, LLC is the premier Scaffold, OSHA, and General Safety training institute, serving the tristate area as well as various locations throughout the United States and Canada. Accredited by the International Association for Continuing Education and Training (IACET), Approved by the New York City Department of Buildings, combined with a team of OSHA 500 Certified Instructors that have over 100 years of experience, we provide top of the line training for a large variety of customers, such as business owners, supervisors, workers, engineers, NYC DOB licensees, etc. in the construction and industrial work force.